Once again Robert Bryndza thrusts you into the world of police politics and a Rottweiler detective that won’t let anything go. DCI Erika Foster is once again presented with a case that is anything but predictable. With seemingly unconnected victims DCI Erika Foster has to dig deep to solve the mystery of The Night Stalker. This is one of those books that will have you checking under your bed for days, some things really do go bump in the night. A reputable doctor is drugged and suffocated in his bed, a man who is newly separated from his wife and child and is seemingly breaking into the gay scene. DCI Erika Foster’s superiors want this passed over to hate crimes but Erika’s gut is telling her that this has nothing to do with the doctor’s sexuality. As in The Girl in the Ice, Erika soon finds herself ignoring commands and department politics and flies solo as she desperately tries to unravel the unfortunate demise of Doctor Gregory Munro. When a Jeremy Kyle type TV presenter becomes the second victim it is soon apparent that there is a serial killer on the loose, affectionately dubbed “The Night Stalker.” This is a killer that stalks their prey, knows the ins and outs of their lives, drugs and subdues them, disconnects them from the outside world and then suffocates them with a “suicide bag.” Methodical, clever and leaves without a trace, The Night Stalker is one clever cookie and Erika Foster and her team are up against it. With this book, Robert Bryndza also expands on the many character’s personal lives which really helps you to begin to paint a picture of each and every character, it is that character connection that has really made this an unputdownable series. Erika Foster is my spirit animal, a woman that is strong, fiercely independent, extremely intelligent and is a natural detective. She has the “nose” and is not afraid to put herself or her career on the line to reach an end result. Yes, she has her flaws, her personal life is shot to hell, but despite everything she has been through she is a Pitbull when it comes to her cases. Her superiors feel she is a loose cannon, but deep down they respect her and her results. While she bends rules, it is never for her own gain, it is to give closure to the victims and their families, she has a huge heart. I have a huge soft spot for our forensic pathologist, Isaac Strong, I adored him in The Girl in the Ice and he has only cemented himself as a firm favourite in The Night Stalker. The whole team are characters that I have come to “know” and with every case they work, that connection only gets stronger. With chapters in the voice and mind of our Houdini like Night Stalker, Robert Bryndza really ramps up the suspense and anticipation as the net closes. The unhinged and evil ramblings really add to that bone chilling feeling every time the Night Stalker is mentioned. 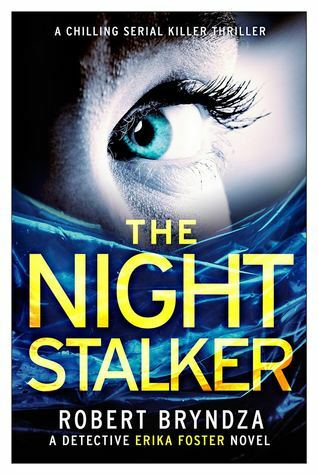 With twists and turns aplenty and a brazen “I am untouchable” contact with The Night Stalker, Erika Foster and her team have to dig deep to solve this case. With a third victim, one that comes a little too close to home for Erika and her team, the battle really commences. The team are like family, no one touches the team and you never leave a man behind. I cannot wait to read more from this series, compelling and totally addictive.